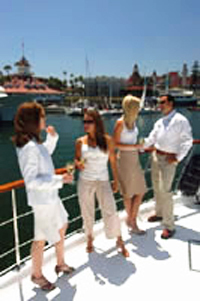 You will board the Inspiration at the Harbor Island Sheraton Hotel & Marina and be taken on a relaxing and intimate bay cruise featuring photographic points of interest such as the San Diego Skyline, Seaport Village, the Midway, and the Coronado Bay Bridge. 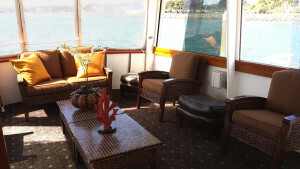 Food and beverages are available and customized charters can be quoted based on your party’s needs and guest count. Prices do not include marina dock fees and San Diego Port District taxes, or additional services such as food & beverage or other incidentals unless otherwise noted. Prices and packages are subject to change from published rates. 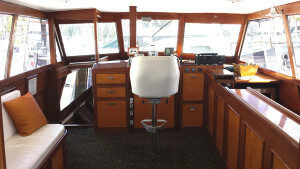 Each charter may be different and your special requests are welcome. Gratuities are not included in the package pricing. 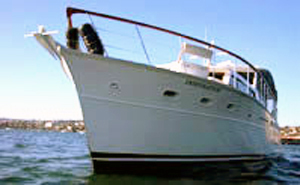 Port Bow of the Inspiration Charter Yacht. The Inspiration invites you to enjoy the sights and sounds of beautiful San Diego Bay aboard our luxurious fully restored classic 63′ mahogany Motor Yacht. Let our experienced and courteous crew provide an event to remember. 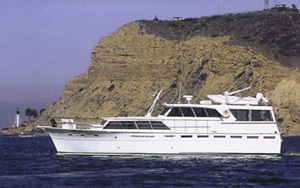 Available for private charter or per-person scheduled cruises with appetizers and no host bar. 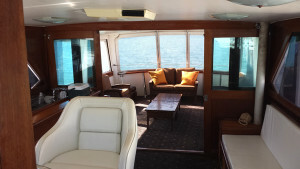 Plenty of space aboard the Inspiration motor yacht for corporate meetings or casual gatherings. business or social functions, and smaller intimate rooms for quiet or private conversations. No matter what your plans, booking a private charter on the Inspiration is sure to be the perfect place to host your event! Having undergone a complete renovation, the Inspiration has been restored to the original pristine condition of her maiden voyage. She is beautiful both inside and out. Her interior decor is fashioned from varnished all-mahogany wood and adorned with polished brass and chrome accents, while her exterior is a sparkling white. 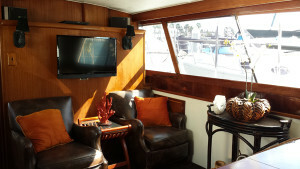 A fully stocked solid mahogany bar – the perfect spot to enjoy a relaxing cocktail – runs along the upper deck, while a state-of-the-art cassette/CD sound system pumps out your favorite music through boat-wide speakers. The roomy master stateroom and guest room, frocked in warm and inviting colors boast private attached full heads (bathrooms) and are located on the lower deck to ensure ultimate privacy. 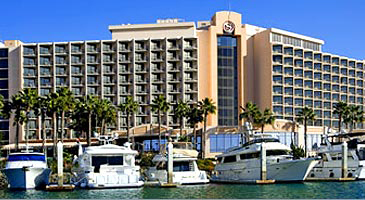 San Diego Sheraton Hotel and Marina. Resort and Marina. San Diego, with its tropical climate, boasts some of the most beautiful weather in the world allowing for comfortable, year-round yacht charters for your own private yacht cruise along San Diego Bay and Coronado Island. Enjoy the beauty of the San Diego city skyline, our world class harbor, Coronado Island, and the Coronado Bay Bridge, all from the deck of your private motor yacht charter. The Inspiration is certified by the U.S. Coast Guard to carry up to 35 passengers and a full crew. She has a professional, licensed captain making her a prime choice when you are looking into private yacht charters in San Diego for all types of special events, corporate incentives, or simply to enjoy your own private party aboard an excellent vessel! Chartering the Inspiration is ideal for parties up to 35 passengers in a single party, or booking just yourself and a special friend, or a few special friends on a semi-private scheduled bay cruise. You may select from any of the suggested cruise packages in the box to the right, or we will consider customizing a package for your party depending on your needs or desires. 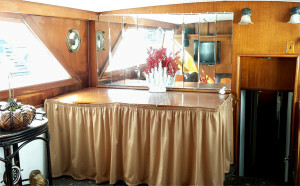 The Inspiration is ideal for casual bay cruising with friends and family, or corporate team building events. Multiple on board heads (bathroom) with fresh water sinks. 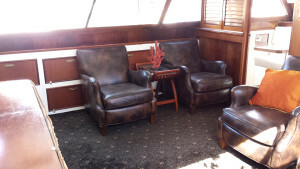 Salon with comfortable seating, perfect for casual socializing or corporate meetings. Professional and courteous captain and crew.